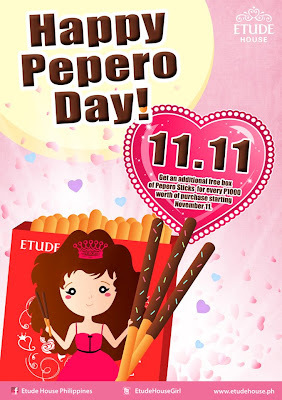 According to Wikipedia- Pepero Day is an observance in South Korea similar to Valentine's Day. It is named after the Korean snack Pepero and held on November 11, since the date "11/11" resembles four sticks of Pepero. The holiday is observed mostly by young people and couples, who exchange Pepero sticks, other candies, and romantic gifts. Now let's focus on Pepero which started it all. 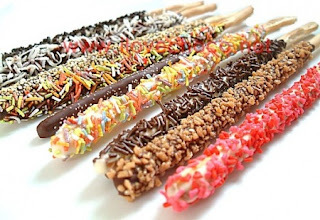 PEPERO (빼빼로) is a cookie stick, dipped in chocolate syrup, manufactured by Lotte Confectionery in South Korea since 1983. It was inspired by the Japanese product, Pocky produced by Glico. Isn't it amazing that they have a celebration inspired by food? And I thought Koreans are not into sweets and junk foods since most of them are slim (well, majority of their actors and actresses are). Anybody who tried Pepero sticks?